Vislink Technologies (Booth C6008) announces that it has once again partnered with Grass Valley, a Belden brand, on an all-in-one broadcast solution. 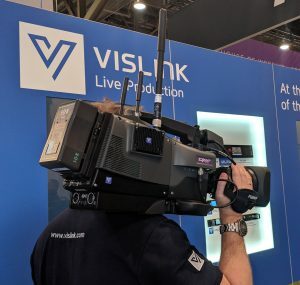 Grass Valley’s newest LDX 86N Series 4K-RF camera is now integrated with Vislink Technologies’ INCAM-HG wireless camera transmitter, which provides HEVC 4K UHD, HDR-ready wireless encoding and a remote-controllable camera interface via Wi-Fi. Vislink Technologies’ INCAM-HG wireless transmitter is integrated into Grass Valley’s newest LDX 86N Series 4K-RF camera. Building on the technology from Vislink Technologies’ end-to-end HCAM solution, the INCAM-HG offers single-frame–latency image acquisition. Perfect for ENG, sports, and event applications, the INCAM-HG is designed for all the latest image-capture needs, including UHD, HDR, 4:2:2 Chroma and 10-bit Luna. With an intuitive user interface and FocalPoint camera control, the INCAM-HG provides a simple-to-use, cable-free, grab-and-go camera solution. The Vislink Technologies INCAM-HG is available with several frequency-band solutions, 1.3-7.75 GHz, and offers up to 16 preset channels for tuning. The omni-irectional 3-dBi–gain antenna provides an adjustable 10- to 250-mW transmission power. The transmitter includes COFDM DVB-T and LMS-T modulation options, and the integrated UHF receiver operates in the 410- to 490-MHz RF range. Available with bandwidth-efficient HEVC compression, as well as MPEG-4 video encoding and multichannel AAC, MPEG-1, and AES/Dolby E audio passthrough, Vislink Technologies’ INCAM-HG supports 480i, 576i, 720p, 1080i, 1080p and 2160p video formats. This fully featured and flexible capability ensures that the INCAM-HG can fulfill the needs of all video productions. In addition to the Vislink booth, the INCAM-HG wireless camera transmitter is on display at the Grass Valley booth (SL106).